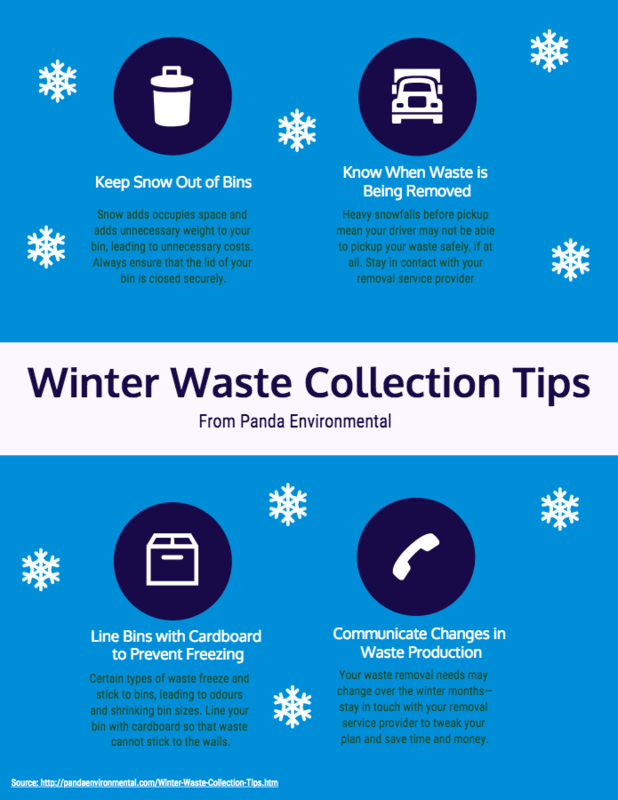 As the winter months are now upon us, waste collection will begin to differ noticeably from the summer months. As such, businesses must now take a few more steps to ensure efficient waste removal. Panda Environmental is able to perform waste collection services from businesses, corporations and institutions year round. Contact us today. 1. Snow takes up space that waste could occupy, leading to the need of unnecessary waste removals. 2. Snow increases the weight of the bin, which leads to higher costs. Typically the cost to remove waste is calculated by the weight of the bin. If snow is adding extra weight to a bin, this can unnecessarily drive up waste removal costs. The heavy, wet snow of the fall and spring is especially prone to adding weight to bins. An easy fix to this problem is to always ensure that the bin lid is securely closed. If it snows heavily the night before your scheduled waste pickup, the driver may not be able to pickup the waste safely or at all. This can lead to either waste being left to sit for an additional week, or to having to call for a unscheduled pickup on a different day. Waste is typically removed in fixed interval, so be sure you are in contact with you waste removal provider about what that day is. Certain types of waste - especially organic - can freeze and stick to bins. This can lead to a shrinking bin size, as well as to noticeable odors when the temperatures rises and the waste starts to rot. In order to combat waste sticking to a bin, place cardboard in the bin so that waste does not have an opportunity to stick to the walls. Many businesses and corporations change their waste removal needs slightly over the winter months. It is important to let your waste removal provider know of any anticipated changes to your waste production, as they may be able to tweak your removal plan slightly to a more optimal process. Doing this can save both time, and money. Panda Environmental has been a leader in responsible waste management and recycling solutions in Southern Ontario for over 15 years. We are able to service all waste needs, including hazardous waste. Click here for a list of all of the waste management and recycling solutions that we provide.